Healing Music Frequencies: Not only do these tracks feature radiant and beautiful uplifting music, but they are a perfect companion to the other two options (brainwave entrainment and subliminal affirmations). This allows you to utilize the technology wherever you might be; even driving or at work. 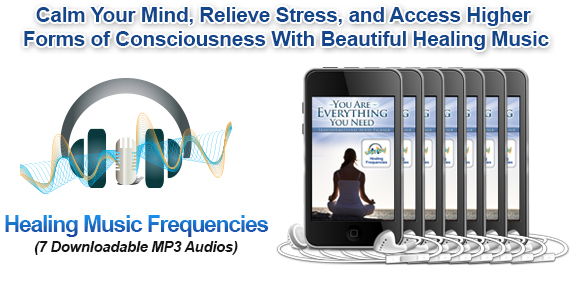 With these music-only tracks, the affirmations and brainwave entrainment are removed. However, you still receive the benefits because your brain recognizes the music from the previous audios and automatically starts the brain balancing process. 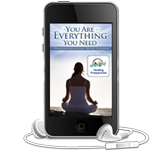 The deep inner peace and gratitude provided in these audios, calms your mind and relieves stress. It also provides the root or gateway to higher forms of consciousness and access to your own innate powers of manifestation. Rediscover your inner inspiration for living a happy, joy-filled, abundant life. Simply breathe out and relax as your stress melts away and you begin to heal on a soul level. Experience a sense of peace and tranquility with deeply moving music and elegant shifts in your awareness that sweep away the negative energy of the day. Relaxing music surrounds you in a heavenly blanket with feelings of security, success and blessings. Connect deeply with your soul for a true understanding of how beautiful, magnificent and limitless you are. This track relaxes and calms your body, mind and soul allowing you to see the resources you have available to you. Relax as these healing frequencies open your mind and soul to the knowingness that you are everything you need. Infinite possibilities and all the resources you will ever need exist deep within you. This musical masterpiece resonates with the hypnotic rhythms and vibrations of pure love and acceptance. Experience the frequencies moving through your body and removing the rigidity of your day, replacing it with the softness of infinite love. Be carried away as this heavenly music slowly transitions into a beautiful hypnotic lull that reminds you there are no missing pieces. There is nothing for you to find, do or be. Right now in this moment you are perfect, ready and whole as you have always been. Relax and allow the healing frequencies of pure bliss to wrap around you, reach deep inside and help connect you to your whole and perfect self. Encounter a deep serenity while listening to beautiful rich melodies. Allow yourself to release into a relaxed state of mind. Let the music’s gentle vibration resonate through each and every cell in your body. Feel a connection with the Universe, experiencing its wisdom. Know that you have within you the same knowledge for a joyful, wonder filled life. Step into a meditative world of infinite possibilities with frequencies designed to awaken you to you. Gain a sense of relief and familiarity as you come home to the realization that you are so much more than you have ever known. This track is a perfect blend of smooth atmospheric sounds, light piano and voice that will lull you into a greater awareness of what is truly possible. Feel the deep breath circulation through this body/mind cleansing. Invigorate & awaken your consciousness to the joy of all that life offers. Experience a sense of inner peace and calm that is rarely felt in our busy lives. Reconnect with the consciousness of profound change and transformation that lies deep within you. This enchanting and exquisite music is designed to lead your heart and soul to unexplored worlds. Unwind, relax and let the stress melt away. This moment is just for you. Now all that is left is to try these for yourself.